Tim knows better than anyone, if I see a combination of brass and wicker, I'm instantly scheming ways to make space for it in our apartment. 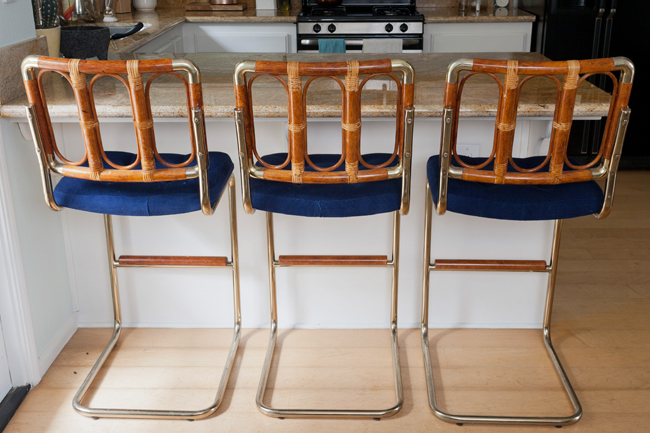 I found the stools on one of my regular craigslist perusals for "wicker | rattan" (a search for all posts with the words wicker or rattan - check out this post for more advanced searching tips). The brass and rattan frame was perfect, but the upholstered cushions were... ahem... not doing it for us. But THAT, my friends, is an easy fix. Initially, I wanted to use dark blue velvet on the seats, but after looking at the prices of upholstery grade velvet, I decided to cover the cushions in a much less expensive fine navy blue corduroy. From a distance the fabric looks like velvet, but it's a lot easier to clean and I won't want to cry if someone spills spaghetti sauce on it. 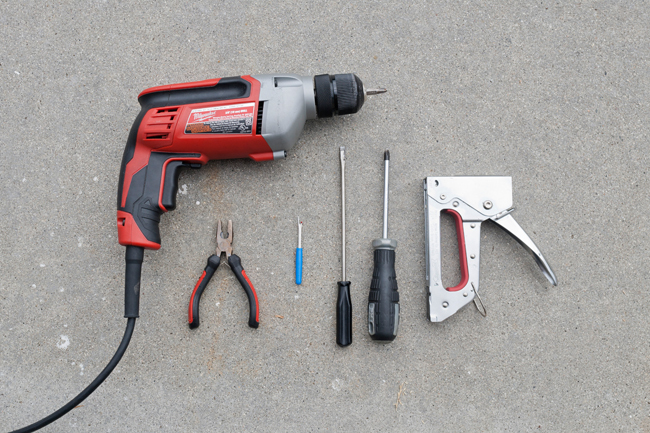 My basic reupholstery kit was a drill, pliers, screw driver, philips head screw driver, staple gun, and seam ripper. 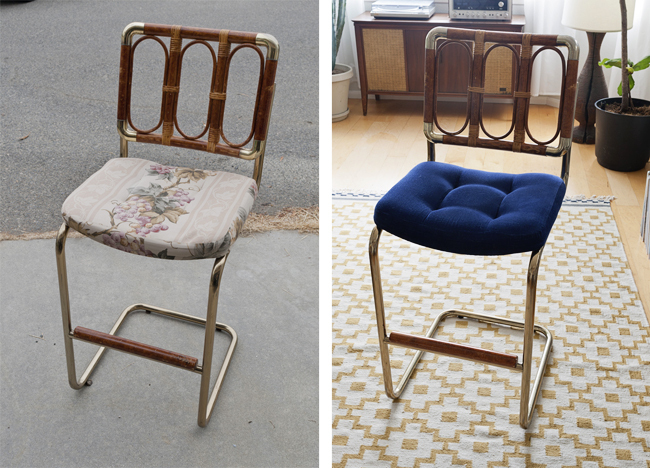 Seat cushions are the easiest way to dip your toe into the world of reupholstering. The trick is to make sure the seat is relatively easy to remove. Mine just screwed right off. 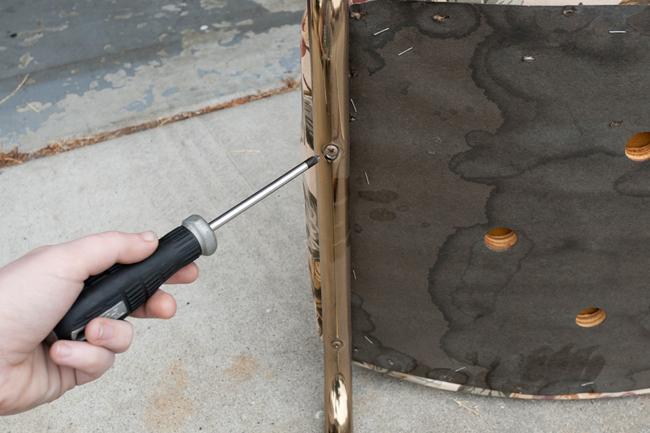 Use the screw driver to carefully dismantle the seat, removing all of the staples and the old fabric. Once you've removed the old fabric, use the seam ripper to carefully deconstruct it - these separated pieces will be the pattern for your new cushions. Once you've cut the cushion pieces out of your new fabric, reverse the whole process and reassemble your cushion. If you're worried you might lose track of things, write down every step you take while disassembling the old cushion. Or better yet, take photos. 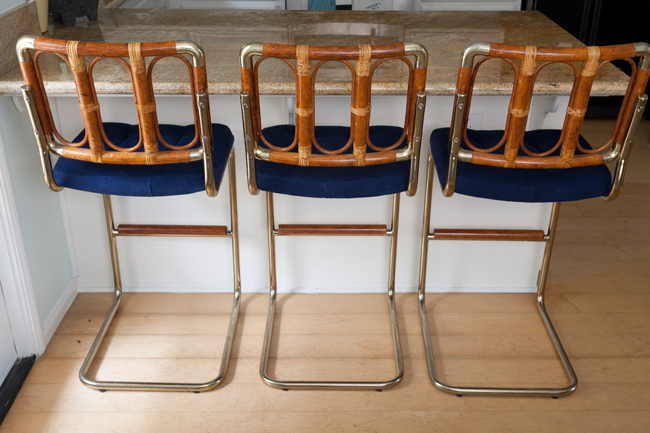 In the end, I bought each of the stools for $16 and spent about $30 on fabric and thread, for a grand total of around $78 or $26 per stool. Not too shabby considering remotely similar stools online are going for $200 each! 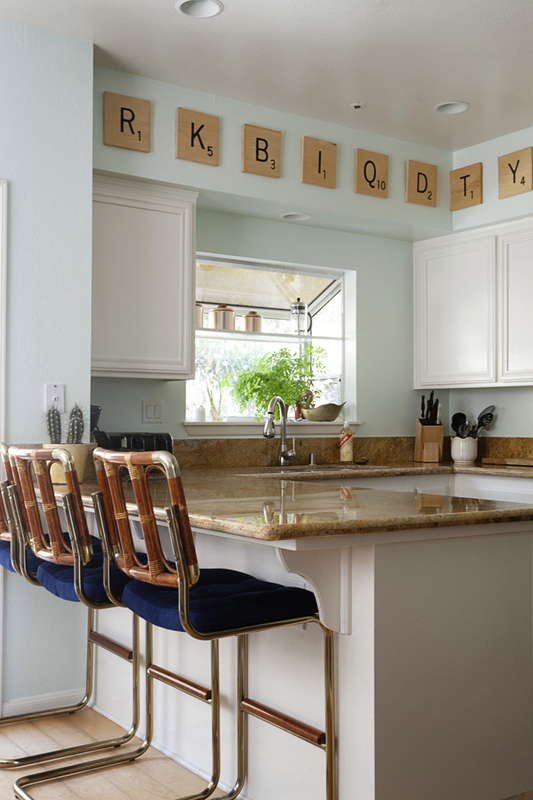 Just the right amount of personality for our kitchen. So whaddya think? Something you would try?